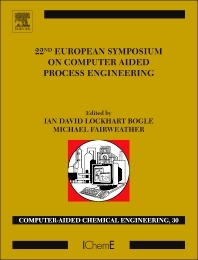 Computer aided process engineering (CAPE) plays a key design and operations role in the process industries. This conference features presentations by CAPE specialists and addresses strategic planning, supply chain issues and the increasingly important area of sustainability audits. Experts collectively highlight the need for CAPE practitioners to embrace the three components of sustainable development: environmental, social and economic progress and the role of systematic and sophisticated CAPE tools in delivering these goals. Towards defining a quantitative methodology to enhance the sustainability performance of major international events. Indentifying redundant environmental objectives in the design of heat-exchanger networks using rigorous dimensionality reduction techniques. Computer aided estimation of sustainability of biodiesel production from palm oil. Automated optimization model to perform sensitivity analysis on cost of investment required to upgrade treatment plants in water networks. Food supply chain planning and quality optimization approach. Bridging the Experience Gap - How do we migrate Skills and Knowledge between the Generations?